@WikiTora I’m glad to know you enjoyed NITW! It’s one of my favorite 2017 games – and indies, in general. Love the aesthetics and the humor. I recommend replaying it if you haven’t yet! Trying both routes can be very rewarding. Also, we seem to have a similar taste in games. You’ve been playing some lovely things! Have you ever played Botanicula? Amanita Design is releasing a new game soon: CHUCHEL. Considering I’ve played theirs Samorost 3 recently and was absolutely swept away by it, I can’t wait for their upcoming title! I’ve been playing Hollow Knight for about two weeks now and it’s an amazing game, silly cheap for the content it offers. In fact I think they might have spoiled their chances at success a little by setting the price at $15 from the start. I think people just don’t expect a sub $20 game to be very good for some reason and they could easily have sold this for $25-30 and would probably have sold more and it’d still be well worth it. Even though I would still have waited for a 50-75% sale. Currently in the process of hunting down all the little odds and ends I might have missed and unlocking hidden endgame content before going to the end boss. I think you might be able to come back and do this stuff afterwards if you want to but I’m just enjoying platforming and fighting my way through this world still so I’ll just do keep doing that for a while longer. There’s a fair bunch of extra bosses to fight and I think I’m going to have to accept I’m just not fast enough to beat them all. It’s not that they’re particularly tricky, I mostly know what to do and how to handle their patterns. But the signals from my brain just doesn’t reach my fingers in time to do the things and that’s kind of unsettling. So my brain decides it needs to try to guess the next incoming move in order to get the info to my fingers in time and that’s just not correct most of the time and it all just descends into a panicky mess. I have come to realise I really enjoy metroidvanias recently, exploring an open world that slowly unlocks as you find more tools to overcome challenges in the level design is a very appealing process. I would highly recommend Hollow Knight to every one. If you read about the creation process behind the game (thanks Blood, Sweat and Pixels!) the team made promises in relation the the Kickstarter tiers they reached. They wanted to make the best game they could possibly make, an homage to the NES classic era, and wished to hold up their end of the bargain since the public was good enough to allow them to give up their regular jobs. All the extra content was probably something they wished they could monetise but I expect that they didn’t want to give up the good will. I’ve played Samorost when it was a browser-based game (developed with Flash I believe), great art style! I will try a second playtrough of Night in the woods when I’m done with Hob. Thanks for the advice. @Fraggles you’re right, Hollow Knight is a steal for that price. A total bargain and a fantastic game too! Actually beaten hollow knight now. Well 103% completion rate and beaten the Radience. Still have not fought most of the dream version of the bosses though, as they’re just a little too much for me. I could maybe beat one or two of them with a great deal of luck. I repeat myself of course but this game is amazing and I don’t really want to stop playing it. I’ve put a little over 54h into it, though I have spent a fair bit of time just moving around the levels without purpose because it’s just fun to do so and of course several hours fighting bosses over and over. I also picked up Invisible Inc. on the side in order to have something that doesn’t require fast twitch reaction times as that wears me out after a while. I have not yet finished a full run of it though so I can’t speak much about it but it’s pretty decent turn based tactics. However I find the procedural generated levels a little bothersome some times. Games like these are often approachable more like a puzzle game rather than a tactics some times and benefits greatly from well crafted thought out levels. Seems like you some times end up with levels here where side objectives just are not feasibly achievable if you happen to explore the wrong side first. Other times levels ends up way too easy and you get everything nicely lined up and with an abundance of resources easily picked up. I’m currently halfway through the “2nd phase” of the game and things are picking up in difficulty, might speak about it again once I’ve finished a run or two. But now I want another good metroidvania. Good metroidvania = Ori and the blind forest. I agree entirely, I enjoyed it a great deal earlier this summer. What? No Ori is not particularly hard at all. That is something I’ve never heard anyone claim before. It’s not an easy game I suppose, there were certainly a few points where I struggled a little, but I can’t say I ever felt it required more from me than I could muster. Certainly does not deserve a reputation for being super hard, I don’t think you should let anyone scare you away from playing this magnificent game. Yeah, it isn’t hard and it’s a beautiful game. You can make it hard if you challenge yourself to complete some of the hardest achievements. You may end up drying some times because of instant death moments that you have to avoid, but that’s ok. Checkpoints are your friend! Like Momodora: Reverie Under the Moonlight for example, it may look tough, but only if you make it so. The easy mode can be a breeze and the game is really cute. I’m still trying to get the courage and time to beat it with Pacifist + Insane difficulty at the same time, if something touches you, you’re dead, but you also can’t kill anything, only the bosses. I absolutely love that game, and it’s made by another brazilian! Certainly does not deserve a reputation for being super hard, I don’t think you should let anyone scare you away from playing this magnificent game. Woah thank you so much for saying this! I have no idea how the idea got into my brain, then. But I’ll certainly put Ori back on my radar now. Thanks! Yeah, it isn’t hard and it’s a beautiful game. You can make it hard if you challenge yourself to complete some of the hardest achievements. Ooooh… this right here is a tendency I must admit I have haha. Not something I’m proud of, but alas something I do. I’ll try not to go too crazy getting 100% on Ori when I finally get my hands on it, though. I absolutely love that game, and it’s made by another brazilian! As @Fraggles said, Ori isn’t an unfair game. It does feature some chase and escape sections that can be challenging, but the respawn is quick and you can quicksave your progress almost anywhere on the map by manually dropping checkpoints. Ori and the blind forest also features an incredible original soundtrack and an emotional story. On top of that, the controls are responsive and the art style is gorgeous, with a vivid and wide ranging color palette. If you like this genre, you shouldn’t miss Ori. Talking about metroidvania, I’ve just finished Hob. It’s really good! Thank you very much for your insight! I’ll definitely look into now that everyone’s been so insightful. I’m not big on platformers, but I’m sure I’ll love it for the art, soundtrack and story. 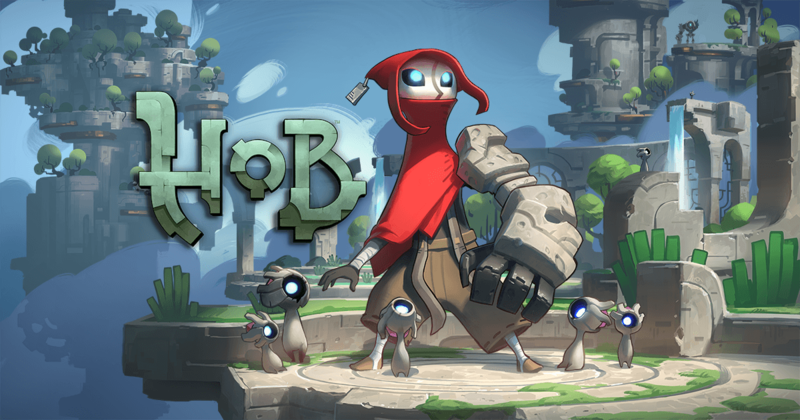 As for Hob, I heard great things about it! Definitely on my list as well. I just beat shadow of the colossus for the first time on my ps3. Goddamn is that an amazing game, absolutely fantastic. And, as far as I know, there is nothing else like it, it is really special. I’ve just finished playing Hob and I must say that I’ve enjoyed a lot this overlooked little gem. Hob is an adventure game in metroidvania flavour, like any classic top-down Zelda title and Hyper Light Drifter, to name a couple. The game sports really nice looking cell-shaded graphics with some steampunk elements. In fact, the whole world of Hob is like a gigantic clockwork machine which you are tasked to restart and reshape. The reasons behind your mission are misterious at first, but become much clearer in the end where a plot twist and even some decisions awaits. On a sad side note, Runic (developer of Hob) had been recently shut down by Perfet World, so don’t expect any patch or frequent updates for this game, or a Hob 2. I haven’t met any game-breaking bug during my time with Hob, only some minor clipping glitches. Other than that, the game runs smoothly at max settings on a modest PC. An overall enjoyable game, fun to explore, with thight controls and interesting lore. Highly recommended. Oh folks, I’ve started Cuphead and I feel like a super human after beating the tutorial in one try. I’ve also finished playing Gorogoa, a pure puzzle game developed by one person, Jason Roberts, in a time-frame of four years. It’s a remarkable puzzler, maybe the best I’ve experienced in recent memory. The gameplay if pretty straight forward, you solve the puzzle by re-arranging four animated tiles, narrating a cryptic story. It’s a work of art, a short but interesting experience, very accessible and enjoyable. It’s on mobile too, iOS I believe. GOROGOA IS MAJESTIC PEOPLE, GET IT. ahem Sorry for caps. It’s just that I waited 5 years for this game, bought it on release day – a first in my life, thus far – , and still haven’t been able to string a few coherent words together to write it a proper review. And that’s correct, it’s also on iOS. Cheaper there too. Just finished Her Story. What an interesting and casual but very engaging and full of surprises. It is a visual novel and there is no traditional game component. It’s also wonderfully acted and worth the time and experience. A well crafted old-shool dungeon crawler that is also very accessible and streamlined, with an interesting story and lore, well acted dialogues, tense moments and a fantastic steampunk style reminiscent of Bioshock. Following a recent update, Vaporum now features the option to pause the action, turning the game into some sort of turn based action-strategy title. That’s something that I’ve enjoyed a lot and ended up using for the whole game. Behind the shiny graphics and the amazing motion capture, there’s a game part walking simulator and part hack and slash, all sprinckled with some light puzzle elements. Blend all of this, add the best sound design and voice acting that you can think of, remove the HUD, and you’ll get Hellblade: an enthralling and unforgettable experience. This is a must play, if your PC can run it and your ears are able to handle binaural sounds. “The body is starting to pixelate”, by reading this line during the first minute of play, I knew that I was in for a fun beeping time. Thimbleweed Park isn’t the classic love letter to some defunct game genre, it’s a phenomenal new entry worthy of the point-and-click pantheon. The whole game drips of mistery, puns and fourth-wall-breaking jokes. The acting is good, true to the genre, the characters are funny and weird in many different ways and the story is interesting. Have you enjoyed any of the Lucas Arts adventure games? If so, then play Thimbleweed Park.